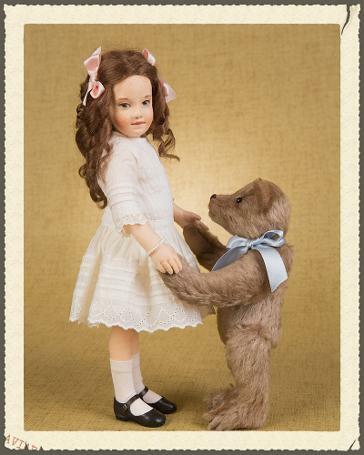 We are pleased to present "Teddy &Me"
Teddy measures 8 inches tall and is made of the finest Shulte mohair in a soft light brown shade. Five-way jointed, Teddy has glass eyes, hand-embroidered features, paw pads made of 100% wool felt and a pure silk bow around his neck. His winsome companion, Me, is a 12" all-felt doll with joints at the hips, shoulders and neck for expressive posing. A sculptural torso and limbs and separately sewn fingers add to her realism. Me has a hand-knotted wig made of the finest mohair with silk bows, and a lovely molded felt face with hand painted features. She is costumed in an authentically detailed Victorian Summer dress made of embroidered Swiss lace with tiny pintucks and mother-of-pearl buttons. Around her wrist is a dainty pearl bracelet and on her feet, hand-cobbled leather Mary Jane shoes.